It’s 7:30 in the morning on Father’s Day. We were hoping to catch a few extra minutes of sleep, but Miles has decided it’s time to get up. He spots Andy, who has been gone for a few days, and reaches for him. He climbs over me, smiling and giggling, trying desperately to reach his daddy and poke him in the face. There is no doubt about it…he loves his Papa. Despite being exhausted, Andy is happy to wake up and see his boy. He gets dressed and asks Miles if he wants to get some donuts. So off my boys go, leaving me to get ready alone. No sleeping in. No breakfast in bed. To my husband, Father’s Day means just that…being a father. It’s hard to believe that a year ago Miles was still just a baby in my tummy, growing and kicking, but not yet fully invading our lives. Now he’s a happy, active ten-month old who enjoys splashing in the toilet, climbing on everything, and munching on avocado. Andy and I can’t remember what we did with our time before Miles was born. Yes, Miles has completely invaded our lives and turned them upside down. Surprisingly enough, however, my man has not only taken all this changing in stride…he embraces it and loves every minute. Andy adores his little man, despite the giant poops, frequent night wakings, and never getting a moment’s peace. He loves showing Miles things and taking him places. He loves watching him grow and learn. And Miles? Well, he just adores his Papa too. Sometimes I like to just sit in the other room, listening to my boys giggle as Andy reads Miles his Elmo book. Or watch them play “Don’t Wake the Grizzly Bear (aka, Papa)”. 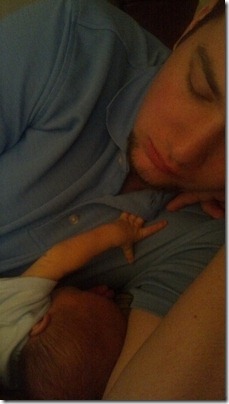 Or watch as Miles reaches for his daddy, then lays his head on his big, strong chest. Miles knows that he is always safe with Papa. Always loved, always protected, always cared for. I’m so thankful for this man of mine, who doesn’t see fatherhood as the end of his life. Instead, he sees it as a wonderful gift and blessing, to cherish and treasure. Miles doesn’t know it, but he is a very lucky little boy. Happy belated Father’s Day, Andy!! !